LAX and Tooshlights are also working with Infax, the data-driven provider of innovative IT solutions for airports and other public venues, which works in conjunction with Tooshlights to play a leading role in the smart restroom transformation. Tooshlights provides Infax with real-time venue-specific data that allows airport officials to track the occupancy usage of restroom stalls. The new smart restroom technology being deployed at LAX combines cutting-edge technological innovation with a unique design aesthetic to solve the critical problems of cleanliness and efficiency of public restrooms. According to an Airport Council International (ACI) Airport Service Quality (ASQ) Survey, the availability of washrooms/toilets is one of the top five most important items to all LAX guests in 2017. 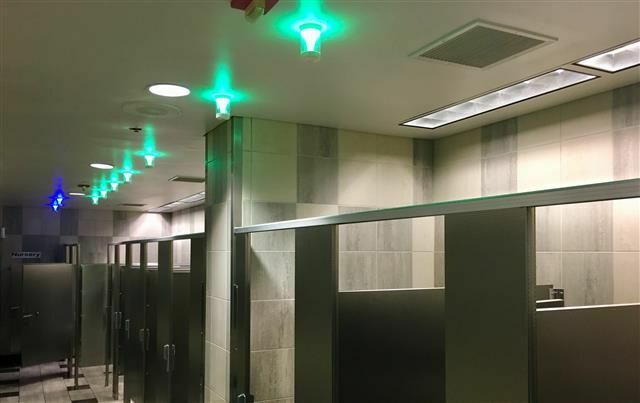 The LAX smart restroom pilot program of the Tooshlights system includes more than 20 smart restroom stalls, which will work similarly to parking garage lights. Each unit consists of a smart latch and indicator light. When the stall is available, the light is green. When the stall is occupied, and the smart latch activated, the light turns red. There are also blue indicator lights for ambulatory stalls. LAX is leading the way on technology, by leveraging smart building technology and data analytics to boost operational efficiencies. In addition to thestalls themselves, the Smart Restrooms also have touchscreens near the entrance/exit, forguests to easily provide feedback on the status of the restroom –and thenidentify any issues that require amaintenanceor custodial response. Touchscreens placed at the entrance/exit of the smart restrooms allow guests to provide real-time feedback regarding restrooms including the need for supplies, maintenance and/or custodial services. This is just one of the many ways that LAX is using technology to improve the guest experience, which also includes the use of Automated Screening Lanes in several terminals, biometric screening for boarding on some international flights, and the recently launched integration of the airport’s maps, including restrooms, pet relief areas, and concessions, into the Apple Maps app. LAX recently launched its new website, FlyLAX.com, and real-time flight information and parking information can be found there, and by “asking Alexa” for LAX information. For more information about Tooshlights, please visit https://tooshlights.com/. For more information about LAX and its technology initiatives, please contact laxpr@lawa.org. Los Angeles World Airports (LAWA) is the City of Los Angeles department that owns and operates Los Angeles International (LAX) and Van Nuys (VNY) general aviation airports, as well as aviation-related property in Palmdale. Both play an integral role in helping to meet the Southern California regional demand for passenger, cargo and general aviation service. Both airports make a distinct contribution to the strength of the system as it provides a high level of safety, security and service for its customers, communities and stakeholders. More information rel=”noopener noreferrer” can be found at flylax.com. As a covered entity under Title II of the Americans with Disabilities Act, the City of Los Angeles does not discriminate on the basis of disability and, upon request, will provide reasonable accommodation to ensure equal access to its programs, services, and activities. Alternative formats in large print, braille, audio, and other forms (if possible) will be provided upon request. Based in Los Angeles,Tooshlights — powered by Modus Systems LLC — is the industry’s firstand only automated LED lighting system that increases traffic flow in public restrooms by letting the guest “know where to go.”Thepatented,sleekly designed smart restroom solutionissolving a massive pain point for consumers – privacy and long wait times. Tooshlights enhances the guest experience, helping toincreaseprofits andeliminateawkwardnessof people not knowing which stalls are open.Thecompany’spatented technologyalsoaimstobetter connect people with the spaces that they occupy through the use of real-time, venue-specific information. Tooshlights can dramatically improve restroom traffic flow of all types of commercial spaces such as,arenas, stadiums, airports, malls, hotels, convention centers, casinos, theme parks and office rel=”noopener noreferrer” buildings.For more information, please visit www.tooshlights.com.FollowTooshlightson Twitter@Tooshlights.